Last week, Gill’s Cruise Centre, reportedly the third largest cruise retailer in the UK, ceased trading. We have a look at some of the reactions and revisit the failure of Cruise Control, the last major cruise retailer to go bankrupt in the UK. Elsewhere, while Los Angeles has been thought of as the US West Coast’s cruise centre since Princess Cruises was founded there, Seattle now puts up a good argument for taking the lead. And with the first call by Blount’s Grande Mariner, Detroit opens its new cruise terminal today. Earlier this month, Carnival UK (P&O, Princess and Cunard), Royal Caribbean UK (Royal Caribbean, Celebrity and Azamara) and Fred. Olsen Cruise Lines, all of them concerned at the level of the agency’s debts, started to take payments directly from Gill’s customers. Then, last Tuesday, Carnival UK terminated its agency agreement, an action that was quickly followed by Royal Caribbean and Fred. Olsen. This resulted on Thursday in Gill’s announcement that it could no longer take any new bookings. The Association of British Travel Agents (ABTA) followed up by terminating Gill’s membership on Friday. Customers who booked through Gill’s will be protected by the cruise lines and will be covered either by their ABTA bond or by a Civil Aviation Authority ATOL (Air Travel Organisers License) in the case of fly/cruises, and have been asked to contact the cruise line with whom they are booked. This sequence of events actually seems to date back some months, as Gill’s had sought to restructure and cut costs in March, when it closed its central London office, which it had opened in 2008, relocating the staff back to its original base in Cardiff. But this appeared to be too little too late. There were suggestions from competitors that not only were Gill’s costs too high but its discounts were too low. Gill’s chairman Alistair Gill described trading as “a challenge” while attaching some blame to a cut in commission to 5% by Carnival UK. However, this cut applies only to 2012 bookings, and not this year’s business. Up to 100 staff are thought to have lost their jobs but the business model at Gill’s has recently involved a lot of deep discounts, which they rebated from commission, and heavy press advertising. Despite Gill’s closing, things have moved on very quickly. Today it was announced that P&P Associates, the company behind Asda Travel, had moved to take over Gill’s assets, including its database, and begin a new operation called WeCruises. Other brands in the P&P portfolio include online retailers WeFly and WeHoliday. On the very day they went under, Mabel Ward posted this under “very poor customer service”. But poor service, sacrificed to rebates, is only part of the story. Ironically, another seems to be overspending. Almost six years ago, in October 2005, the similarly-sized Romford-based agency Cruise Control went out of business after Carnival UK put them on “stop sell,” a move prompted by delayed bill payments. Cruise Control was reported at the time to have had an annual turnover of about £90 million. This report also stated that following a review of the affairs of the Essex-based company prior to its failure and points raised by creditors, a report had gone to the disqualification unit of the Department for Business, Enterprise and Regulatory Reform. Part of Cruise Control’s business was absorbed by retailer 1st4cruising, which by the end of the month had snapped up its 226,000-name database. When this happened on November 1, 2005, 1st4cruising’s new owner Harry Goodman claimed his agency was now the largest independent cruise specialist after fighting off stiff competition to acquire Cruise Control‘s customer database. Goodman said it contained 236,000 names and addresses, 100,000 of whom have previously booked a cruise. Combined with the existing 1st4cruising list, Goodman claims his new database numbered about 600,000. The difference between Gill’s and Cruise Control was basically that Gill’s was an old established family company, while Cruise Control was a brash upstart. But both gave away too much commission to “buy” the business and both were said to have spent too much money on advertising. Neither supplies us with a good business model. There was a time when Los Angeles was considered the centre of cruising on the US West Coast, with Stan McDonald’s Princess Cruises based there, and from 1990, Crystal; Cruises. But San Francisco was always a competitor, especially in the days of famous Royal Viking Line, which was based at One Embarcadero Center. Today, however, Seattle is coming to the fore. Holland America has of course been based in Seattle since 1978, and the city was also the home of small ship line Cruise West until last September. But that is slowly changing, and while Seattle’s cruise business has been growing, largely at the expense of the Alaska trade that used to use Vancouver, Los Angeles’ business has also been diminishing because of a slump in bookings to Mexico. The latest recruit to Seattle is of course Seabourn, which is now housed in separate space in the Holland America Line headquarters building in Elliott Avenue. Holland America already employs 1,139 people in Seattle but the move by Seabourn from Miami bringing about another fifty, compared to the 116 employees it had in Florida. It is said that the move of Seabourn into Holland America headquarters will save the line up to $25 million a year. Two more cruise lines can also be counted. A year before Seabourn arrived, Paul Gauguin Cruises established themselves at nearby Bellevue. And the newly-independent Windstar Cruises, once operated by Holland America Line, still maintains its base in Seattle. And even if Cruise West is gone, American Safari Cruises and its newly-formed InnerSea Discoveries division, which operates two small ships in Alaska, have filled part of that void. Lindblad National Geographic also maintains an office in Seattle to oversee its two Alaska small ships, the Sea Bird and Sea Lion, while Zegrahm Expeditions and its Eco Tours are Seattle-based as well. 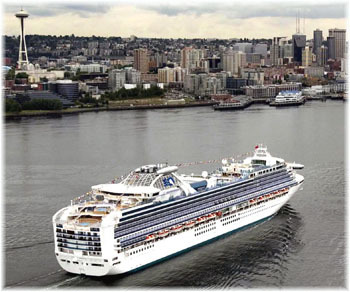 That makes a total of seven cruise operations running about thirty ships based in Seattle compared with two lines and nineteen ships based in Los Angeles. With the arrival of the 100-passenger Grande Mariner, the Detroit-Wayne County Port Authority will open its new Public Dock and Terminal today. The Grande Mariner, which is operated by Blount Small Ship Adventures, arrived from Cleveland on Sunday and will sail for Windsor after the ceremony today. This new $22 million facility will be available for use by cruise ships, visiting naval vessels, tall ships and perhaps even by a new ferry service to Windsor, Ontario, across the Detroit River in Canada. The last ferries disappeared with the opening of the present bridge. 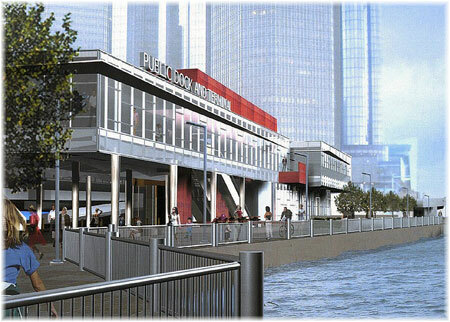 Part of a 5&1/2-mile redevelopment of the whole Detroit waterfront, called River Walk, in addition to customs and border patrol facilities for the clearance of incoming cruise ships the 30,000-square foot Public Dock and Terminal will house new offices for the port authority. 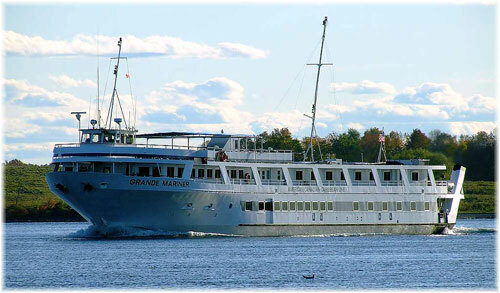 Blount have introduced two new itineraries recently, between New York and Toronto and between Toronto and Georgian Bay. Another cruise line newcomer, yet to be announced, is planning six departures and six arrivals from Detroit between June and September of 2012, handling a dozen passenger loads to and from Chicago, Duluth and Quebec City. Meanwhile, Hapag-Lloyd Cruises’ 14,903-ton Columbus, a candidate for which the terminal was originally developed, is to become Plantours’ Hamburg in the spring of 2012. The largest ship to cruise the Great Lakes in recent years, she first came into the Great Lakes in 1997. Nevertheless, while she will change operators, it is hoped to attract her back to the Great Lakes under her new name in 2013.